JVC (Victor Company of Japan) has launched its new HD Everio GZ-HD7 recently. The latest Everio GZ-HD7 is the first consumer full High-Definition 3-CCD hard drive camcorder capable of shooting and recording full HD images (1920 x 1080i), according to JVC. Besides, this Everio equipped with an 60G hard drive which can store nearly five hours of full HD 1920 x 1080i recording at a high 30Mbps or seven hours for 1,440×1,080 video quality. 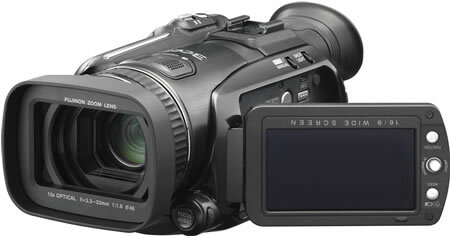 The JVC HD Everio GZ-HD7 has a professional-grade 10X optical zoom lens from Fujinon which used in broadcast video cameras, now being used in a consumer camcorder for the first time. The lens is coated with EBC (Electronic Beam Coating), which prevents light reflecting off the lens surface, thus greatly reducing video flaring and ghosting. There is image stabilization system on board to prevent any of the quality loss associated with unstable image moving. For bright, realistic colors, HD Everio uses three 1/5-inch CCDs – one each for red, green and blue, incorporating 16:9 progressive scan CCDs and pixel shift technology. With optional HD Everio Share Station CU-VD40, you can easily transferring high definition footage to DVD-R/-RW discs via a USB 2.0 cable. In addition, your HD video which record in the MPEG2 Transport Stream video format can be burned onto Blu-ray discs with the included PowerProducer software and a high-definition Blu-ray recorder. The latest JVC HD Everio GZ-HD7 is selling for about $1800.